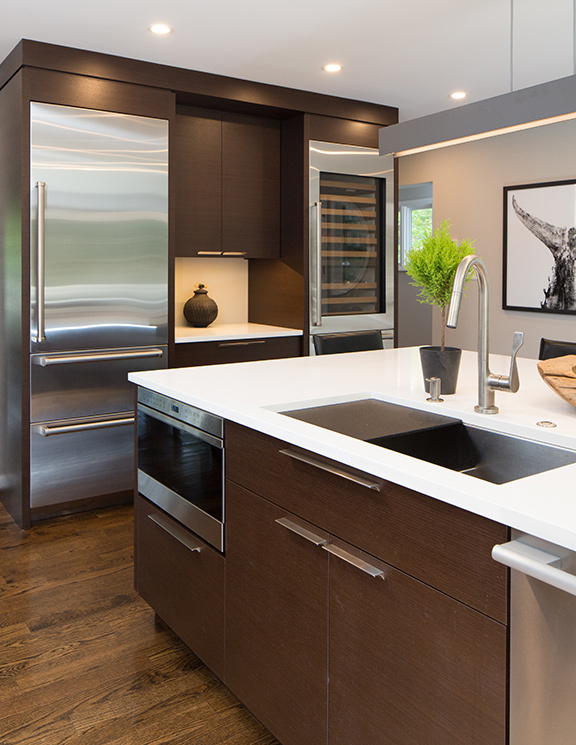 Gegg Design & Cabinetry, along with Becca Design, brought a 1980s remodel into modern times. 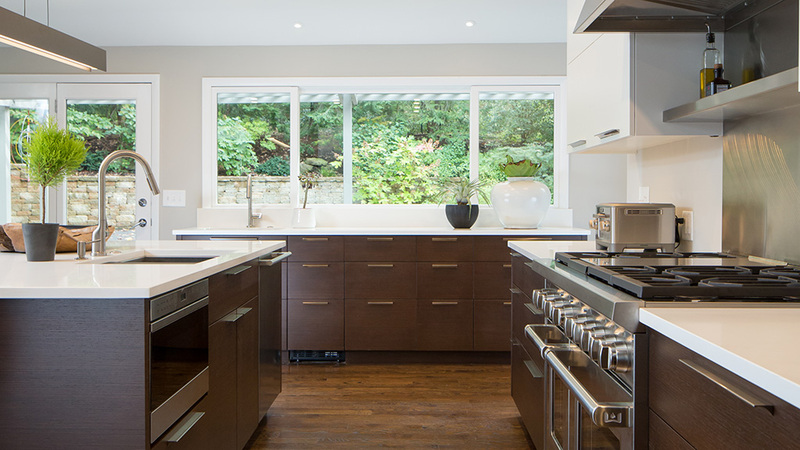 The white laminate cabinets were replaced with naturally-finished, horizontal-grain-3matched, engineered quarter-sawn Wenge and painted wall cabinets on the range wall. Tile flooring was removed and oak floors throughout the house were extended into the kitchen. Layout-wise, the old kitchen had a cooktop located in a position that was very visible from the living space, and two doorways cut off the view from the kitchen into the same space. To address the layout challenges, the designer opened the two doorways as much as possible. The 48” range was situated in the center of the kitchen across from the island. A 30” refrigerator/freezer and 30” wine and refrigerator drawers split up the refrigeration needs. The new island is simple and clean with seating on three sides for interaction and views out into the green space that surrounds the home and includes a sink, dishwasher and microwave drawer. 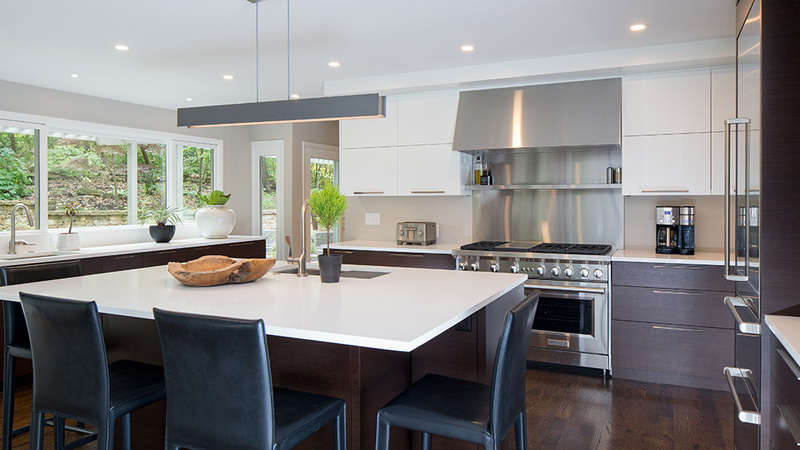 A custom stainless-steel hood was designed with clean lines and crisp edges. The custom backsplash and stainless shelf align with the hood for a seamless look. The clean and simple look of the new kitchen improved interaction with the surrounding outdoors and opened the lines of site into the rest of the home and living space without making the functional portions of the kitchen visible to the living areas. Goal accomplished. This rock-star kitchen has a great layout and connection to the outdoors. We like how the designer created symmetry with the fridge and wine refrigerator.